Photo by Emily Files, KRBD – Ketchikan. You might not expect an ancient Aboriginal instrument from Australia to find its way to Alaska. But walk around downtown Ketchikan on a warm day and you may hear 15-year-old Kinani Halvorsen playing her didgeridoo. She’s played the unusual instrument for three years. 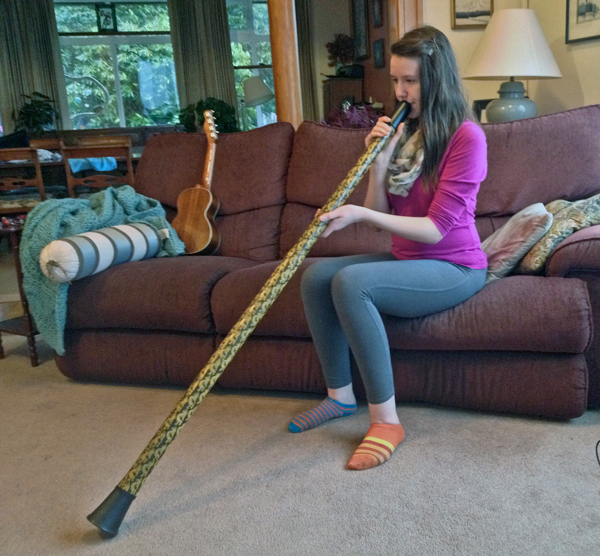 And she hopes to bring the didgeridoo into the mainstream band practice. Here’s the response Kinani Halvorsen got from a boy in her 7th grade band when she played the didgeridoo a couple years ago. The tube thing is actually not so little. Kinani is a tall girl, and the didgeridoo is a tall instrument. It comes up to her shoulders, at about 5 feet. You can’t exactly play any Katy Perry or Macklemore on something like this. So why is a high schooler here in Ketchikan playing this ancient Aboriginal instrument? It all started with an Australian substitute teacher in Kinani’s fourth grade class at Houghtaling Elementary School. “He brought in his didgeridoo and I thought, ‘Wow! That is coolest thing I’ve ever seen,’” she said. Fast forward a few years. It’s 6th grade, and Kinani has been playing the trombone for a year. She walks into McPherson’s, a local music store, and there on the shelf, is a didgeridoo. Kinani swore to her mom that she wouldn’t throw the instrument in the closet. She brought it home and started practicing. Her older brother, Keelan, was upstairs. Kinani has been playing her didgeridoo for three years now. She’s had to teach herself, because there isn’t anyone else she know in Ketchikan who plays the didgeridoo. Her brother is impressed. The didgeridoo is over 1,000 years old. It’s still used to accompany song and dance in the Arnhem Land region of Australia. “What really motivates me to keep playing is it’s such a unique instrument, unless you’re in Australia, you really don’t get a chance to see, hear, or play something like this,” Kinani said. Kinani is in four bands. Three at Ketchikan High School, and one other outside school, called Sound Waves. 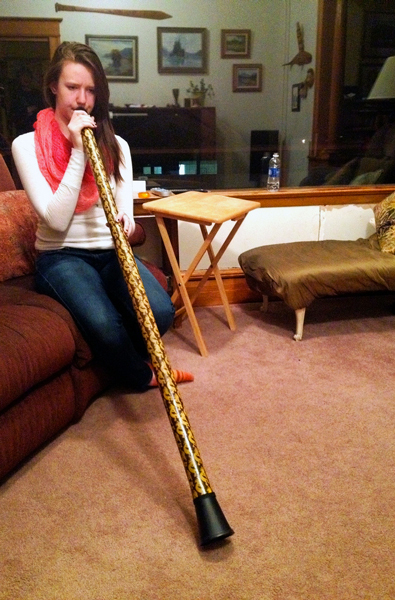 She’s been on a mission to incorporate the digeridoo’s sound into more traditional music. “We haven’t had occasion or any particular reason to hear her play it in here, because this is a big band that is mostly saxophones, trumpets, trombones, rhythm section,” Roy McPherson, director of the Sound Waves band where Kinani plays trombone, said. The didgeridoo is nowhere to be seen at a recent practice here. But in a couple weeks, that’s going to change. Kinani has a didgeridoo solo in the band’s upcoming show, during “I Wanna Be Like You” from The Jungle Book. And she’s going to keep trying to play her didgeridoo in different settings. She’s attending the Sitka Fine Arts Camp this summer. “And so I’ll bring it and I’ll talk to whoever’s running the class and I’ll say, ‘Hey I have a didgeridoo, is there anything I should bring it in for?’” Kinani said. Emily Files is a reporter at KHNS in Haines.